Some of the great scenery at the Wild Horse Dirt Fondo. Dave Gontrum begins the climb of the Hastings Cutoff Pass from the east side of the Cedar Mountain Wilderness. The climb gains about 950 feet over 3.3 miles, topping out at 5,775 feet. The Stansbury Mountains are in the background, about 15 miles to the east. 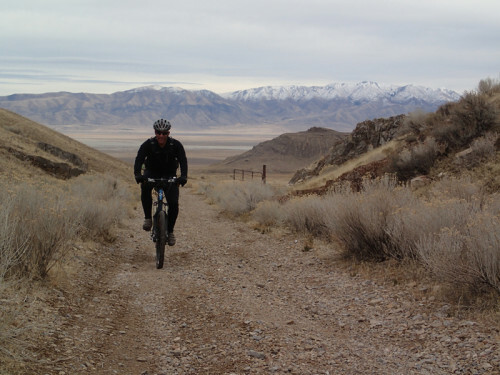 May 11, 2015 – The Inaugural Wild Horse Dirt Fondo will be held this Saturday, May 16, 2015 just west of Salt Lake City in the Cedar Mountains near Delle, Utah. Organizer Chris Magerl provided Cycling Utah with the details of the event. County-maintained 2WD dirt and gravel roads around and across the Cedar Mountain Wilderness Area. Little Wild Horse option of 31 miles, 1,800 vertical. Covers many of the same segments as The Wild Horse. Separate start at 10 A.M. Starting and finishing in Delle, Utah. The start line is less than one hour west of SLC on I-80. The Wild Horse is a supported Dirt Fondo. This is not a race, but there will be a mass start, times will be recorded and posted at RideWildHorse.com. There will be three aid stations on course, with food, water and a portable bathroom. Also sunscreen, first aid supplies, basic bike tools, pump, NoTubes sealant, ProGold Xtreme lube. There will be a sweep and sag service. There are cutoff times for each aid station. Details can be found at RideWildHorse.com. This year’s event is limited to 300 participants, in any combination of The Wild Horse/Little Wild Horse. The Wild Horse will benefit the Utah League’s Scholarship Fund. The Utah League is a part of NICA, the National Interscholastic Cycling Association. Yeah, the high school mountain bike league. Every participant will receive one raffle ticket for the prize table. Additional tickets will be available through the event’s registration page. Every dollar of every additional ticket will go directly to the Utah League’s Scholarship Fund. The Utah League’s Scholarship Fund makes it possible for all interested high school kids to take part in the fun. Loaner bikes, donated clothing, help with entry fees, the Utah League’s Scholarship Fund makes this possible. The Cedar Mountain Wilderness is home to more than 600 wild horses. Yes, less than one hour from downtown SLC. Virtually no vehicle traffic here. Roads will not be closed for any portion of this event, but it is not unusual to pedal out there for hours without seeing a single vehicle. This is not singletrack, but it is not pavement, either. Basic dirt and gravel bike handling skills will be needed for climbs, descents and corners. While the route can be ridden on a CX bike with 35C or bigger tires, it might not be pleasant. Expect to spend at least four hours to complete The Wild Horse. Not many folks have four+ hour rides on a CX bike on gravel. For most of us, a MTB, rigid or suspended, will make for a more comfortable and faster day. The Wild Horse will make for a great training day for the Crusher, P2P, Leadville or Lotoja. This will not be an easy day. Cresting a hill and seeing the road twist and roll in front of you for miles with no buildings, no cars, no billboards, is a mental challenge rarely faced in Utah. Both The Wild Horse and Little Wild Horse will traverse the Hastings Cutoff, the ill-fated shortcut used in 1846 by the Donner-Reed party. You will pedal part of the National Historic Trails route, and see vistas that will give you a sense of awe at the determination and strength of the pioneers who trekked west across the Salt Flats. There is only one chance to ride the inaugural event. Join in. You will face a challenging day, explore all new terrain close to home, and be helping high school kids find the joy of cycling, too. In case of severe weather, please check http://ridewildhorse.com or http://facebook.com/ridewildhorse for news updates. Views from the Wild Horse Dirt Fondo course. Utah's Cedar Mountains has incredible scenery. Photo by Chris Magerl. One Response to "UPDATED: Event Preview: Wild Horse Dirt Fondo now to be Held May 30, 2015 in Utah’s Cedar Mountains"